Heracleum persicum was introduced to Norway as an ornamental in the 1830′s. Towards the end of the 19th century, it started spreading outside gardens, later to become a frequent sight in the major towns and settlements of North Norway – and a veritable pest plant. During the last 100 years or so, a substantial ethnobotanical tradition related to the species has evolved, demonstrating that folk knowledge is not only forgotten and lost, but also charting new terrain. This survey is based on data extracted from all relevant publications, including botanical literature, travel accounts, newspaper notes, etc., as far as they have come to my attention. In addition, information on vernacular names and various uses of the H. persicum in Norway has been extracted from my own, substantial archive of interviews, questionnaires, and correspondence related to the ethnobotany of Norway. Where extant, H. persicum tends to be known to everyone, even by city dwellers who otherwise generally neglect plants. People tend to love or hate it, and in Tromsø, the largest town of northern Norway, the species has become more or less emblematic of the city. Both here and in other areas of northern Norway, it is referred to by a variety of vernacular names, partly borrowed from other species, partly derived from the Latin genus name, and partly coined for this species only. In the latter group, tromsøpalme (‘the palm of Tromsø’) has proved by far the most popular invention. It was seemingly first used (and coined) by German soldiers during the World War II occupation of Norway, but now largely replaces other vernacular names. The plant is still popular with children, who frequently play in and with it, whereas adults have been more prone to speculate on its origins – and how to get rid of it. Salt is the most popular “herbicide” for this purpose. Over the years, H. persicum has accumulated at least twenty different vernacular names in Norway, and a variety of other traditions. By necessity, all these traditions are less than 180 years old, showing that even modern and urban societies may produce a substantial body of plant lore, which certainly merits ethnobotanical attention. Ethnobiologists lament the loss of traditional knowledge across cultures worldwide, and frequently express their intention to salvage what is still left (e.g., [1–3]). “Westernization”, or perhaps rather the influence of the modern world, is frequently blamed [4, 5]. Locally, over-exploitation and eradication of relevant species may potentiate the loss of local knowledge . In some cases, it is even claimed that there is little or nothing left to collect, as suggested e.g. in a comment on the use of wild plants in pre-industrial Scandinavia: “Most of this knowledge is now forgotten and opportunities to gather data in the field are dwindling” (: 153), thus leaving only archival and published records as extant sources. In their review of ethnobiological research in Europe, Pieroni and others noted more generally that “Fieldwork is still possible, especially in eastern and southern Europe” (: 205). Several recent works, e.g. the large compilation of British plant lore provided by Roy Vickery , a recent study of old and new food plants in Europe , and my own experience from Norway, would rather suggest that field work is both possible and fruitful in many north European countries as well. It is obviously true that vernacular plant names and plant uses related to traditional subsistence farming are rapidly disappearing. Despite this, selected elements of the old folk plant knowledge may live on, simply because they are still considered useful and relevant, e.g. when traditional medicinal plants provide better cures than doctors may offer – as noted in Norway e.g. for treating herpes zoster with Linnaea borealis L. , and colds and rheumatism with a decoction of Rhododendron tomentosum (Stokes) Harmaja . Restricting the scope of ethnobotany to traditional lifestyles and the past presents a strictly limited view of what the field should cover. In some ways, it is rather similar to the (mainly) American notion, as expressed e.g. by Richards Evan Schultes when visiting Britain, “The British Isles have no ethnobotany” (see : vii), i.e., that only traditional knowledge of indigenous peoples has any claim to being ethnobotany; a limitation only conceivable in a nation (U.S.A.) consisting mostly of immigrants. Still, it ignores the fact that any immigrant group will bring portions of its own plant knowledge and traditions, often to some extent adjusting it to the flora of their new homeland, and thus merging old and new into novel bodies of ethnobotanical knowledge, as has been well documented e.g. in Europe [13, 14]. Anyone, no matter their ethnicity, has some relationship with plants and animals, which is bound to produce at least some knowledge or tradition worthy of ethnobiological interest. Modern city and town dwellers may have much less contact with nature than their ancestors, but they are still bound to meet, eat, like and dislike a substantial number of plants. In doing so, they will obviously use a number of vernacular names, coining new ones as needed, and frequently accumulating a variety of other lore in the process. This paper provides an example of such modern ethnobotany, by compiling vernacular names and plant lore, including uses, related to Heracleum persicum Desf. ex Fisch. in Norway. It was introduced as an ornamental to the far north of the country in 1836 . Thus, the entire body of tradition presented here has accumulated in less than 180 years – and most of it probably after 1900, when the species started spreading outside gardens in earnest. It was soon to become a veritable pest plant, and is now duly black-listed in Norway as an aggressive alien . The present study is based on a variety of material, extracted partly from my database of publications providing data on plant names and uses in Norway (currently running into some 7000 references), data found in a few archival sources; and, in particular, records in my own extensive collection of ethnobotanical data collected through interviews, questionnaires, and correspondence, over the last 35 years or so. These latter are referred to by year and record number, e.g. EBATA 1978:23 (see Additional file 1). Having spent most of my life in areas with abundant Heracleum persicum, I have frequently run into people who possessed various kinds of local knowledge related to the species. Large Heracleum species were fashionable in 19th century European gardens, not least due to their stately growth. Fruits of several taxa were imported and sown, but by far the most important species was H. mantegazzianum Sommier & Levier from the Caucasus  – now an invasive pest plant in many countries (e.g. [18–24]), and subject to numerous studies on control measures (e.g. [25–32]). In Norway, H. mantegazzianum is largely confined to the country’s southernmost parts [33–35]. Further north, in the coastal areas of central and northern Norway, another large, escaped Heracleum is a familiar sight, and may predominate in towns, ruderal areas, abandoned fields and along sea-shores [15, 34, 36–38]. The species found here differs from H. mantegazzianum in a number of characteristics [35, 39]. Compared to H. mantegazzianum, the “northern” taxon is a smaller plant, rarely exceeding 2.5 m, and a true perennial, flowering repeatedly from the same root, whereas H. mantegazzianum is monocarpic, and dies after flowering. For a long time, the identity of the plant found in the north of Norway remained a mystery, and various provisional names have been used for it, including H. panaces, H. giganteum, and, in 20th century Scandinavian literature, H. laciniatum. Recently, a DNA study of large Heracleum species in Europe  provided genetic evidence that the North Norwegian plant belongs to H. persicum – an identification previously suggested, but ultimately rejected by , who found it did not match herbarium specimens from Turkey, differing e.g. in the shape and length of fruit vittae . Thus, it could possibly belong to an as yet unidentified hybrid, though for the time being, H. persicum is the most appropriate name , and the one that will be used here. H. persicum remains the only large Heracleum species with a wide distribution in northern Norway, though the hybrid with the much smaller H. sphondylium L. ssp. sibiricum (L.) Simonk., first reported by , is now becoming common in some town areas [43, 44]. H. mantegazzianum has only been reported from a couple of stations in Tromsø [35, 44–46], and does not seem to thrive in the north. The nomenclatural problem is beyond the scope of this paper, and of little bearing in our context. What is needed here, is an outline of the species’ history in the north, as far as this is known [15, 38]. The first mention of a large Heracleum species in northern Norway is found in the travelogue of W. Christy, a Briton who visited northernmost Norway in 1836 . He brought with him fruits of a “stately” Heracleum, which he distributed at some places in western Finnmark, e.g. at Kåfjord in Alta. They were also used to “embellish” a graveyard in Hammerfest [47, 48]. Soon after, large Heracleums featured in the gardens of the Alta area. From there, plants were brought to Tromsø and a number of other localities in northern Norway. In his account of a botanical expedition to northernmost Norway in 1864, Thore M. Fries noted that a large Heracleum species was a favourite item of the small gardens along the coast of Finnmark; he saw it e.g. at Gjesvær, close to the North Cape (: 30). Later travellers in north Norway also mentioned the plant, e.g. von Heuglin (: 39) and Escard (: 20), who both saw it in Tromsø (Troms). Philip Sewell, who visited northern Norway in 1888, noted that “some coarse species of Umbelliferæ” – obviously Heracleum persicum – was cultivated in the area (: 458). In his review of useful plants in Norway, including ornamentals, F. C. Schübeler noted that what he called H. panaces was grown at many places in northern Norway, all the way northwards to Gjesvær (71°7′ N), that plants were attaining 2.5 m in height, and producing ripe fruits even at Vardø (70°22′ N), with a July mean temperature of less than 10°C, i.e. within the low arctic (: 283, : 232–233). At Hammerfest, cultivation was recorded again in 1894 (: 88), and in the Sør-Varanger area of easternmost Finnmark, it was noted in 1895 that a large Heracleum species had been introduced as an ornamental about thirty years ago, i.e. in the 1860′s, and was now growing “almost as a weed at inhabited places” (: 89). Despite being frequently mentioned from 19th century Finnmark, the species thrives much better along the coast of Nordland and Troms, not least in Tromsø. It was introduced here about 1850, with plants brought from Alta [38, 57–59]. Photographs from late 19th century Tromsø frequently show large Heracleum stands embellishing gardens, and the species is mentioned in some 19th century accounts of the town and its people (e.g. ). Towards the end of the century, the plant was spreading outside gardens, and in his flora of Tromsø, published in 1901, Andreas Notø considered the species an established member of the local flora (: 133). Thus, along with Reusch , Notø is the first to suggest that H. persicum had expanded beyond cultivation, and was getting established as an anthropochore. Unfortunately, late 19th and early 20th century botanists took little notice of introduced plants, generally neglecting them, and thus depriving us of data that would make it possible to follow the subsequent spread in some detail. By the early 20th century, H. persicum formed large stands outside gardens at least in Harstad  and Tromsø in Troms, and possibly at Honningsvåg in Nordkapp, Finnmark (: 65). From the 1940′s onwards, the species was included in the major Norwegian floras. Whereas Rolf Nordhagen (: 466) merely added a note that it was “cultivated all over North Norway”, Johannes Lid (: 412) gave the species full listing, as “introduced in Tromsø and Tromsøysund”; revised in later editions to “introduced in Tromsø and elsewhere in north Norway” (: 192), and “escaped, mostly in Troms and Finnmark” (: 529). The comment in  is the only concrete evidence of a crucial step in the history of H. persicum in Norway, namely its introduction through fruits – in this case imported via England. As noted by , Heracleum “seeds” were heavily advertised and marketed in Britain. Most buyers probably received H. mantegazzianum, but at least some batches of deviant derivation must have occurred, comprising H. persicum and perhaps other species as well. In 19th century Norway, a substantial part of the trade along the coast was with Germany, and it is certainly possible that Heracleum fruits were also imported from German sources. However, bearing in mind that the Heracleum species found in the northern parts of Norway deviates from the plants (mainly H. mantegazzianum) predominant elsewhere in western Europe, it is more likely that they derive from a single, deviant source, with the fruits brought by W. Christy as an obvious candidate. Despite this, folk tradition in northern Norway frequently claims (or assumes) that the Heracleum plants had been brought from northern Russia. This area was also subject to lively trade connections in the 19th century, the so-called pomor trade (from a Russian word meaning “those that live at the coast”, i.e., Russians at the shores of the White Sea, including the major port of Archangelsk). A woman from Loppa in western Finnmark noted that “(…) my mother believed it came through the pomor trade” – i.e., from Russia (EBATA 2006:132). In Sør-Varanger, eastern Finnmark, a woman “had heard that someone in Alta got it from Russian merchants or [some similar source]” (EBATA 2009:27). Literature sources sometimes make the same assumption: “It was supposedly imported from somewhere in northern Russia” (: 448) – but there is no evidence to support this. On botanical grounds, it is unlikely. There are several introduced Heracleum taxa on the Kola peninsula and in the adjacent White Sea area, but these belong to other species (including H. mantegazzianum and H. sosnowskiy Manden and a plethora of hybrids). Their introduction is comparatively recent, and mostly related to the experiments with growing plants transferred from other parts of Russia, carried out in the botanical garden at Kirovsk from the 1930′s onwards . Less frequently, other origins are suggested. At Loppa in Finnmark, people claimed that the plant had been imported from Germany (: 62). Derivations from the Latin name. As a garden plant, H. persicum may have been distributed as packets of “seeds” labelled simply Heracleum, i.e. with the genus name only. The Latin name was certainly known to many of the early cultivators. It was soon borrowed and adopted as a Norwegian name, in slightly modified form: herakleum. No other vernacular name seems to have been used in the late 19th and early 20th century. It was used e.g. at Gressholmen in Harstad about 1900: “We called it herakleum only.” (EBATA 1978:23). It remained the only name used in the area until about 1950, as elsewhere in Troms (see below). Abbreviations that simply make the name shorter, but add no meaning: This group has been particularly productive, resulting in a whole series of vernacular names (arakla, araklia, auraklum, herakla, rakelung, rakleum, uraklium), with further examples (høyrakel, orakleum, ørneklo) in the next subgroup. Re-interpretations, which make an attempt at inserting meaning into the name, by changing at least parts of it into well-known Norwegian terms: Høyrakel is a typical example: høy may mean both ‘high’ and ‘hay’, wheras rakel means nothing at all, but bear at least some superficial resemblance to words like rake, ‘rake’, and rekel, ‘long being’ or ‘long person’. Among the vernacular names used in Tromsø, orakleum carries at least a semblance to orakel, ‘oracle’, though there is nothing to suggest that any fortune-telling use was invented or attempted. In a single case, at Andøya in Nordland, a name in this subgroup is likely to derive from a number of local names (arakla, araklia etc.) in the former subgroup, reinterpreted as ørneklo ‘eagle claw’. It was used in the village of Bleik: “When I grew up at Bleik (I was born in 1949), nobody used any other name than ørneklo.” (EBATA 2005:40). Names borrowed from other taxa. Folk tradition frequently re-uses existing names, in particular if a species is missing in an area, so that its name is “available” – transposition in the terminology of Grenand (, see also ). For instance, blåveis, the predominant name for Hepatica nobilis Schreb. in Norway, is frequently used in the northernmost part of the country, where the species is absent. Here, the name is usually transferred to Geranium sylvaticum L. In similar fashion, liljekonvall, the “southern” name for lily-of-the-valley Convallaria majalis L., is used for Pyrola spp. in northern Norway, where the former is missing. In both cases, similarities are restricted to the flower colour. In the case of Heracleum persicum, vernacular names have been borrowed from other large umbellifers, which at least look slightly similar, mainly Angelica archangelica L., e.g. sløyke in Hadsel, Nordland, and Tromsø, Troms , and sløke in Nordkapp, Finnmark. With some dialectal variations, sløke is the most frequent Norwegian name of A. archangelica in northern Norway (: 217), but as noted at Nordkapp, it could also be used for Heracleum: “They called it sløke. That was the name they used.” (EBATA 2006:101). People were certainly aware that H. persicum was a different plant, e.g. at Hadsel in Nordland: “They called it sløyke. Up in the mountains, there is also real sløyke, the one that you can eat.” (EBATA 1988:13). Further south in Nordland, at Sømna in Helgeland, people have used lur as a name for H. persicum. It is a more general term, deriving from the Norse luðr, denoting a hollow object  – but frequently used for large umbellifers due to their hollow stems. Inventions. The third major group of vernacular names for H. persicum has no parallel in other species. They are inventions, coined solely as labels for this introduced species – or neologies in the terminology of Grenand . Stormtræ ‘storm tree’, recorded in the wind-swept outer-coast town of Andenes in Andøy, Nordland, was motivated by the resilience of the dry stems; they were the only herbs able to withstand the strong winter gales (EBATA 1984:11). Three names incorporating the term rotte- ‘rat’, e.g. rottefrø ‘rat seed’, are obviously pejorative. By far the most successful invention is tromsøpalme, “the palm of Tromsø”, by now the most commonly used name for the species in Norway. It has also been chosen as the official Norwegian name. As such, it was introduced in the third edition of the Norwegian standard flora (: 529). A rather simple derivation of the name was suggested by Ove Arbo Høeg (: 384): “due to its massive occurrences at Tromsø, and its gigantic size, the plant is often called tromsøpalme.” Still, the origin of the name is somewhat obscure. The first mention I have been able to trace is in a German book on the flora and fauna of Norway, intended as reading for the German troops occupying Norway during World War II. According to the text, the plants “was called Tromsö-Palme by the soldiers” (: 32). Thus, it its likely that the name was a German invention, probably intended as a pun, e.g. to contrast the conditions facing soldiers serving in the high north to those stationed in the Mediterranean area, and even more so in the African detachments. The linguist Hallfrid Christiansen was aware that the name had a somewhat jocular quality, commenting that the plant “was popularly and a bit jokingly called “Tromsøpalmen” (: 111). Even in Tromsø, other names previously predominated [75, 76]: “We said herakleum, we did not say tromsøpalme. I would guess in 1947, 1948, we [still] used herakleum. And all of us said herakleum, we had not even heard of tromsøpalme.” (EBATA 2005:32). “We said herakleum when I was a child.” (…) “At least until after the war. Then, the tromsøpalme name became common.” (EBATA 2006:133). Some believed the latter name had gained support through the newspapers (EBATA 2005:19), which may well be correct. As a vernacular name, tromsøpalme has been so successful that it is now largely supplanting all other vernacular names. Some of those I have interviewed could only remember that the plant previously went by some other, now forgotten name (e.g., EBATA 2010:32). Like Heracleum mantegazzianum, H. persicum was introduced to Europe as an ornamental. Old photographs from coastal North Norway frequently show large stands adorning gardens and summer houses (Figure 1), not least in Tromsø (for further examples, see ). As noted in the introduction, foreign visitors were frequently impressed by its vivid growth in the high north. This aspect is mentioned in a number of travel accounts, e.g. by François Escard, a French author, who visited Tromsø in 1884. Like everyone else, he failed to identify it correctly: “I would have liked to send some living specimens [to Bonaparte’s collection in France] of this stout Heraclea sibirica, which emits such a fine scent from all public and private gardens in Tromsø” (: 20). Cultivation is also mentioned in an anonymous description of life at a parsonage at “70 degrees north”, i.e. somewhere in Troms or Finnmark: “Even the Heracleums, which are here almost too much of a blessing, entice our eyes at this time [of year], for you can almost see that they are growing.” (: 100). An example of 19th century cultivation: Rows of Heracleum persicum surrounding a whaling station at the outer coast. 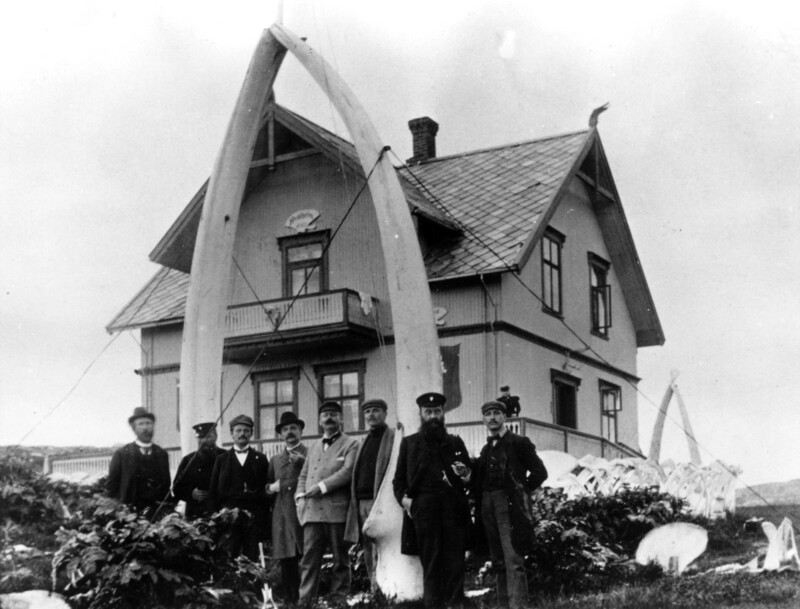 Skorøya in Karlsøy, Troms, 1898 (Photo archive of Tromsø museum). Interviews provide some further glimpses of its use in gardens, e.g. at Dverberg in Andøy, Nordland: “According to what people said, tromsøpalmen was planted around the houses, as an ornamental and to provide shelter. As there is such a lot growing at the parsonage, it is assumed that the vicar’s family has planted herakla in the garden, which was established around 1870.” (EBATA 2005:38). Heracleum persicum was still popular, and being introduced to new gardens, about 1900, e.g. at Reinøya in Karlsøy, Troms: “My grandma (…) had it in a garden there, at Reinøya. I believe it was introduced from Tromsø about 1900.” (EBATA 1995:1). A similar date was suggested at Honningsvåg in Nordkapp (Finnmark): “We’ve got it in the garden here, and it is about a hundred years old” (EBATA 2006:100). As is often the case on the outer coast, it was used to provide shelter: “There are perhaps twenty or thirty meters of it, as a sheltering wall” (EBATA 2006:100). It was put to similar use at Andøy in Nordland: “Araklia was used to provide shelter” (EBATA 2005:47). Nowadays, cultivation is much less frequent, and primarily seen in some coastal villages of the high north, where trees and shrubs fail to grow. Exceptions occur, and H. persicum has been planted as an ornamental at some graveyards in comparatively recent times, e.g. at Laukvik in Lenvik, Troms (EBATA 2007:88). The stout, dry stems and umbels of Heracleum persicum remain a favourite motive among photographers in Tromsø, especially in late autumn and winter. Such pictures are featured by the local newspapers every winter. The decorative, dried-out umbels have also frequently been brought indoors, e.g. in Målselv, Troms: “In the seventies, my aunt had dried flowering stems” – as a decoration. She kept them for years, but in the end, “they were thrown in the sea” (EBATA 2007:50). The umbels have also been used as topics for jewellery and similar small, decorative objects. Several artists have found that the stems provide useful raw material. The collections at Nordnorsk kunstmuseum (Art museum of North Norway) in Tromsø include a large sculpture called Log by Stuart Frost, which is made entirely of rings cut from the hollow stem [78–80] – and he is not the only artist to have been inspired by it . Heracleum persicum is so large, and such a conspicuous feature of the flora, that it can hardly be overlooked. Still, a major cause of its ethnobotanical success, in terms of accumulating folk tradition, is obviously its frequent use in children’s games. The large, stout and hollow stems are eminently suitable for a number of purposes, not least as blowguns. Both dry and fresh stems could be used, e.g. in Harstad (Troms): “As children, we made blowguns from the stems. I remember a mild, liqorice-like taste, though we never chewed the stems.” (EBATA 2011:5). Such use involved a potential risk of sores, as noted at Brønnøysund in Nordland: «As children, we cut tubes of the stem, and used them for blowing rowan berries. Some got sores around the mouth, others not.” . Similar games were played in Tromsø: “I remember Leif told me, they made blowguns from it.” (EBATA 2006:25). Here as well, some had recollections of a definite downside to this practice: “Don’t you get sore on your lips if you use them for blowguns? [It is] an old experience.” (EBATA 2006:4); “We tried them as blowguns, but they made our mouths sore.” In the latter case, the stems were fresh: “I think we took them in summer, when they had grown up. But perhaps we only tried once.” (EBATA 2005:19); “But we played, we used them as blowguns. Our mouths became sore, but we did not think about it.” (EBATA 2005:32). Others took precautions to avoid sores: “Those blowguns I remember, they were not from the green stems, but taken when they were dry. We knew they were dangerous when green.” (EBATA 2006:40). Further north, in Nordkapp (Finnmark), only dry stems were used (EBATA 2007:44). Peas were the ammunition of choice – if available, whether the family consented to such use or not, e.g. in Tromsø: “Yes, peas – but we could not afford to buy them.” (EBATA 2005:19). If not, fruits of rowan Sorbus aucuparia L. provided a useful substitute: “And we used rowan berries, or stolen peas.” (EBATA 2005:32). The children at Honningsvåg in Nordkapp (Finnmark) followed suit: “The rabble I can remember, it was those boys who went about with blowguns and peas.” (EBATA 2007:44). An alternative use of the hollow stems was to spray water. To do so, they were filled with water, and a smaller stem, e.g. of Rumex longifolius DC, was inserted to force the water forward and out. The children at Loppa in Finnmark played in this way: “We also made syringes and had water wars (…)” (EBATA 2006:132) (see also : 105,106). The stems were frequently used more directly as weapons, to hit or fence with, e.g. at Andøy (Nordland): “We used to chop off suitably long stems, remove the top and leaves, in order to use them as swords or canes for fencing” (EBATA 2005:46); “we used arklia stems from the previous year to fence with” (EBATA 2005:47); “the children would run about with it in the autumn” (EBATA 2005:39). In my own childhood in Harstad, Troms, only dry stems were used. As such, they were certainly harmless, and would easily splinter. Other, less considerate users, e.g. in Tromsø, preferred fresh stems: “No, we used them fresh, it provided them with a fine weight.” (EBATA 2005:32). The stout stems were easily available even in winter: “I remember we once used frozen tromsøpalmer as weapons.” (: 16). If combat with other children proved boring, an alternative target was close at hand: “And then we made war on auraklumen”, ie., the Heracleum stands (EBATA 2007:24). Despite these useful properties, the large and dense stands as such were perhaps the most valued aspect of Heracleum persicum among children, not least in coastal areas devoid of forest, and with little to offer in terms of shrubs. The dense foliage provided something that was often considered as “jungles” – a fine area for hiding, and for games in general, e,g. at Hadsel in Nordland: “In a couple of gardens [at the house] where we lived until 1968 there was a lof of tromsøpalmer along the road, almost like a hedge. It was a fine place for hiding when we played hide and seek.” (EBATA 2006:69). Similar games were played in nearby Andøy: “The children used to run about there in the autumn.” (EBATA 2005:39); “We pretended to be Indians, making huts in the araklia jungle” (EBATA 2005:47). The jungles certainly feature lively in the childhood memories of many of those who have grown up in Tromsø, for they would “play Indians in the Heracleum forest” (: 17); “we played Tarzan in swimming suits only [there], and built huts from it”  “We made huts, lived down there.” (EBATA 2006:26); “we made tunnels there” (EBATA 2013:2); “We were hiding there, ran between the plants, and collected dry stems which we used for blowguns, waved or hit with (EBATA 2013:3). “There we made huts from dry tromsøpalme stems.” (…) “There were lots of tromsøpalme here in the old days. A jungle.” (EBATA 2006:40). ”Above the city center, we had a veritable “forest” [of H. persicum] at hand. Here, Robin Hood roamed with his men, and Tarzan, the king of apes. In the cinema, we had seen Indians and cowboys ride across the prairie with the dust raising high behind them. Deprived of horses, even they [i.e., the children pretending to be riding horses in the wild west] would fit under the leaves.” (…) “And last, but not least, quite a few small outlaws have bided their time here, searched for by their family, while the storm abated.” . Children in Finnmark utilized the Heracleum stands in much the same way, e.g. at the island of Loppa: “A small forest of Heracleum which grew at the outskirt of the parsonage’s field provided a fine place for hiding.” (: 105). Similar games occurred at Honningsvåg in Nordkapp: “We grew up with tromsøpalmen. For us, it was a veritable forest; we have no [real] forest.” (…) “I remember our wars very well.” “We played inside [the stand], and would hide there.” (EBATA 2005:34). The hollow stems could also serve as a kind of telescope – or rather, a telescope look-a-like, as noted in Lenvik, Troms: “I remember my grandfather told me that they made binoculars of tromsøpalme. And since its juice is somewhat caustic, they had [sore] raccoon-like rings around the eyes” (EBATA 2005:31). Others would hardly believe that the plants could be dangerous, commenting that the children in Nordkapp, Finnmark “had fought and ravaged and torn apart and hit each other with these [plants], and never suffered [any harm]” (EBATA 2006:100). Florivory, the habit of eating flowers, is common among children worldwide . Heracleum persicum was no exception. At least by children in Tromsø, the young umbels were considered edible: “Yes, we ate the bud.” (EBATA 2006:26). “We ate them. They tasted like cauliflower.” “And I have spoken with several others who ate them. We never got ill.” (EBATA 2005:32). “We even ate rogna [the roe, i.e., the flower] of one» . “Sløyke? Yes, it is the flower buds. You just unwrap them and eat. They taste like cauliflower, and look like it as well.” . Others refrained from eating them: “We never ate tromsøpalma” (EBATA 2006:40); or were told to keep clear: “We were not allowed to touch it” (EBATA 2007:25). Children experimenting with sigarettes might also find the Heracleum stands useful – as a hide-out, and not least because the plant’s strong smell would mask any tell-tale evidence of forbidden use of tobacco: “And then we went into auraklumen, for afterwards it would not smell” (EBATA 2007:24). Except as an ornamental (and decoration), H. persicum is hardly considered a very useful plant in Norway. In the 1930′s, experiments were carried out in Tromsø to explore its potential as a fodder plant . The cows willingly ate it, but as the milk got a distinct taste of Heracleum, the project was abandoned. In folk tradition, only a single record mentions its use for a utility purpose, to light a fire, at Andøy in Nordland: “I have not heard that herakla was used for other purposes, but the stout and dry stems were sometimes collected and used as “firewood” to get turf burning.” (EBATA 2005:38). In Tromsø, I have also seen the dry stems collected for midsummer’s eve bonfires . The use of hollow Heracleum stems to make flutes may be considered a spin-off of folk tradition, where other Apiaceae species are frequently used . Similar Heracleum-based instruments are still sufficiently novel to arouse media interest [91–95]. From the late 19th century onwards, H. persicum has expanded into a range of habitats outside gardens, including ruderal areas, abandoned meadows, seashores etc. Slowly, people have come to realize that the once popular ornamental is an invasive weed – and one that is difficult or impossible to control. As a consequence, they have invented a number of methods to decimate or eradicate it. Some have noted that heavy grazing might suffice, especially if it took place in early spring, e.g. at Andøy (Nordland): “The sheep enjoyed the green sprouts of the herakla, and kept the area almost barren. This put an end to the herakla, and after a few seasons, the weed was gone.” (EBATA 2005:38). Heavy grazing in early spring was equally successful at Reinøya in Karlsøy (Troms): “The sheep used to eat it in spring. And in fact, they kept it down. But then, we made a fence, and the plants were out of reach due to the enclosure. And then it expanded” (EBATA 1995:1). Chopping off the flowering stems before the fruits ripen is obviously effective in terms of halting local expansion, and was practiced e.g. at Nordkapp and Vadsø (Finnmark). Doing so may have been inspired by governmental or other advice (EBATA 2006:100, 2006:117). A popular remedy or “herbicide” along the coast was salt, easily available e.g. from the many fish-handling plants [96–103]. People at Andøy in Nordland preferred this method: “To put down arakla, they poured half-a-bucket, or a whole bucket, of salt among the stems. The salt penetrated towards the root, and death occurred little by little.” (EBATA 2005:46). Another informant in the same area combined salt with cutting down the plants in early spring, allegedly a successful procedure (EBATA 2005:39). Similar measures were used further north as well, e.g. at Lenvik (Troms): “We used to take salt from the cold storage plant, and sprinkle outside the garden fence. Then, they will die, they do not sprout” (EBATA 2005:17). This technique was known in Tromsø as well, but perhaps not too successful: “I cut the stem and filled it with salt. And still, next year it [the plant] was as fine as before” (EBATA 2005:43). Some would first dissolve the salt in water, and sometimes even heat it to boiling before applying it (EBATA 2006:88, 2009:30). Others tried to combat H. persicum by digging it up – at least in one case with the help of local boys looking for earthworms as bait (EBATA 2005:46) – although some suggest that bait from such soils catch no fish . Others would pour solar oil on the roots, a more dubious choice in terms of environmental impact – the latter technique recorded from Lenvik and Tromsø in Troms (EBATA 2009:30, 2010:25). Others report similar use of ammonium chloride [99, 100], gasoline , or paraffin . At Måsøy in Finnmark, even sour milk had been tried, but boiling salt water proved more effective (EBATA 2006:88). The control measures invented locally show some similarity with those tried and tested in a number of scientific studies. In both cases, grazing and herbicides [26–30] are the prime choices. However, salt water may seem a safer choice than glyphosate  – and perhaps worth a study. In Tromsø, H. persicum has become more or less emblematic of the city. It is frequently photographed, and has been used in art and jewellery. 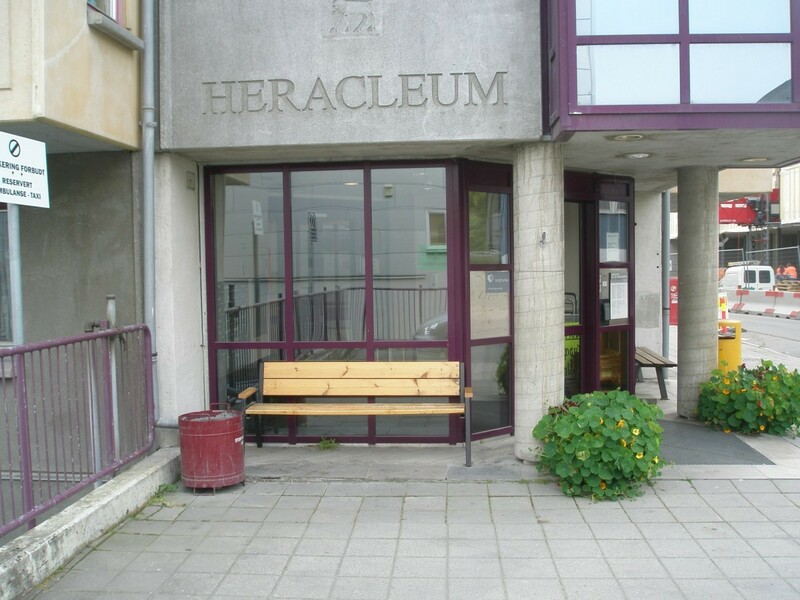 The city’s activity center for the elderly (Heracleum) (Figure 2), an annual school revue running since 1990 (Tromsøpalmen), and one of the major prizes of the city’s annual international film festival (Tromsøpalmen) have all gained their names from it. Heracleum persicum or tromsøpalmen has become emblematic to such an extent that attempts at eradicating the species has met considerable opposition among locals. People are prone to defend the plant, contributing newspaper comments opposing any such action (e.g. [104–110]). Some claim that it forms part of the city’s “soul” or “identity” [107–112], advocating the formation of society of its friends, “Palmens venner” . Others disclaim any harmful effect of the plant’s sap – usually by referring to its extensive use in children’s games (e.g., [86, 114]). It has even been proposed that H. persicum cannot possibly be an introduced species, but rather an indigenous plant which may have survived the last ice age in caves (sic!) at Tromsøya . Others have suggested replacing the reindeer now adoring the city emblem of Tromsø with Heracleum persicum[106, 110, 116–122]. Stimulated by the increasing predominance of tromsøpalme (‘palm of Tromsø’ ) as a vernacular name, Heracleum persicum has become emblematic of Tromsø, featuring in numerous contexts and giving its name e. g. to Heracleum, the city’s activity center for the elderly (August 29, 2012). Norwegian folk costumes (bunad) are popular garments for festive occasions throughout the country, despite being traditionally used only in some district. Areas with no traditional pattern have solved the problem by inventing new ones, and the one for Tromsø of course incorporates Heracleum umbels in its design. At the crown prince’s wedding in 2001, several suggested using a tromsøpalme as the city of Tromsø’s wedding gift, either a live plant specimen, or a glass engraving of it . All this is solid evidence that tromsøpalmen is now deeply engraved in local lore and tradition. With the earliest documented introduction of a large Heracleum species to northern Norway dating to the 1830′s, H. persicum has been a part of our northern flora for less than 180 years. It was popular as an ornamental during the second part of the 19th century, and brought to many stations along the coast. Sixty to seventy years after its introduction, it was well established outside gardens at least in Harstad and Tromsø – and has continued to expand ever since, now occurring at hundreds of localitites in Norway, mainly in Trøndelag (central Norway) and the three northernmost counties (Nordland, Troms and Finnmark). Within less than two centuries, H. persicum has also become one of the few plants almost everyone in the north has heard of, gaining more than twenty different vernacular names, and a solid position in the childhood memories of many of those who have grown up here . By doing so, it also clearly demonstrates that ethnobotany is not a discipline restricted to past or dying traditions. Given suitable material, e.g. a conspicuous alien, even modern town and city dwellers may coin, borrow, re-use or re-shape a variety of vernacular names and plant lore. Disregarding local sentiments, H. persicum has been duly black-listed in Norway , being strongly invasive and an obvious threat to indigenous plants and vegetation types, which are rapidly transformed not least due to its allelopathic effect on surrounding plants [124–126], cf. also , and the heavy shading produced by the dense foliage. In combination with sunlight, the plant’s sap may cause severe burns [128–131]. Such sores frequently feature in newspaper notes, though H. persicum may seem less dangerous in this respect than H. mantegazzianum. In terms of attempts of eradication, people need not worry. The stands of H. persicum are so large and widely distributed that eradication is inconceivable, and the cost alone would be prohibitive. Thus, new generations of children will certainly be able to use it in their games, probably adding more local lore in the process. Perhaps the species will even turn out to be useful (from an adult perspective) after all. Known as golpar in Iran, it is utilized there as a food plant. The fruits are commonly used as a spice, and young stems are harvested for making pickles . In Iranian folk tradition, the plant is considered of medicinal importance, and recent studies have confirmed that it contains compounds of pharmacological interest [132–134]. I thank Sara Saeedi, Teheran, for comments on Heracleum persicum and its uses in Iran.